Plants and trees are deeply embedded in our view of the world and define the landscapes around us. About 515 million years ago, plants first appeared on land and changed the course of history - they have pumped oxygen into the air, broken down rocks, controlled water flow, established nutrient cycles and paved the way for evolution of land animals. Evolution of plants from green algae to canopy forming trees is marked with physiological and morphological innovations. A keen observation of these morphological traits in the plant phylogenetic tree can help in better understanding the process of evolution. Though the current college curriculum introduces milestones in animal evolution, the events in plant evolution are less discussed. Smitha Hegde (Professor, Science education and research, NITTE University) concurs “The UGC prescribed syllabus for Bachelor’s degree in Botany lacks guidelines on teaching the subject of evolution.” Recent efforts by educators had led to the development of card games for science education, through the help of open-access and crowd-funded initiatives. A card trading card game “Phylo” uses animal species cards to teach concepts in biodiversity and ecology. Recently, researchers at the University of Oklahoma have developed a Botanical Phylo-Cards game that aims to introduce students to major plant groups and evolutionary events using a card-sorting activity. 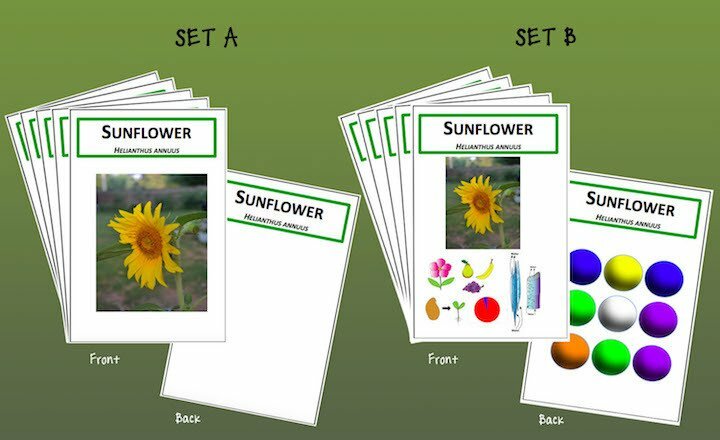 Botanical Phylo-Cards was inspired from the earlier Phylo game and was created to improve the tree-thinking curriculum (understanding evolution using phylogenetic trees) and introduce concepts of inheritance and evolution using various activities and resources. The game consists of two sets of cards – each card in Set A has a photograph of a plant species along with its common and scientific name, while a card in Set B additionally has coloured dots as a representation of genetic information on one side, and figures describing plant traits on the other. The coloured dots in Set B cards represent the sequence of the ribulose bisphosphate carboxy-oxygenase large subunit (rbcL) encoding gene, which is often used by researchers to understand evolutionary relationships between plants. Differences in the number and arrangement of coloured dots between species reflects variation in their gene sequences. Closely related species show greater similarity in their dot pattern compared to species that diverged earlier during plant evolution. The game covers 27 plant species representing a range of extant plant groups including bryophytes (liverworts and mosses), pteridophytes (club moss and ferns), gymnosperms (conifers such as pine and fir) and angiosperms (flowering plants including monocots and dicots). The authors suggest two ways in which the card sorting game can be conducted. In the first method, the players first sort Set A cards into groups based on visual cues from plant photographs (morphology). They then sort the Set B cards using patterns of coloured dots (genetic data) provided for each plant species. The players compare these two independent groupings, where the hypothesis of plant groups obtained from morphology is tested against genetic data. The grouping based on morphology is expected to be crude - with errors coming from misleading morphological characters. For example, players might group plants with a grass-like appearance (e.g. horsetail, ephedra) with true grasses, based on their morphology - these species, however, belong to different taxonomic groups. Another example of crude grouping would be the separation of flowering plants based on flower colour, which would fail to separate monocots from dicots. This exercise can be used to introduce the idea of morphological convergence across distantly related species, and the need for gene sequences to understand evolutionary relationships. The groups created by players using genetic data in Set B can also be used to explain the concept of a phylogenetic tree. Much like a family tree or a pedigree, species can be sequentially grouped based on similarity in their gene sequences to produce a phylogenetic tree. The groups obtained from Set B cards are organized and connections drawn between them to derive the phylogenetic tree. The branching patterns on this tree shows the evolutionary relationships between species. The cards in each of the groups are then turned over to reveal plant trait information. The appearance of vasculature, seeds, fruits and flowers are mapped to different nodes of the phylogenetic tree to understand their evolutionary significance. The second method of conducting the game involves a head-to-head competition between two groups of players. First, the two groups independently sort Set A cards based on morphology. The differences in groupings from these teams are compared to highlight the subjectivity in morphological classification. Next, the teams are presented with Set B cards, where one team uses the genetic data coded in coloured dots for grouping, while the other uses plant trait information. These groupings are compared to look for congruence between plant genetics and morphology. The game gives students a first-hand experience on how botanists use gene sequences to build phylogenetic trees, and reconstruct important events in the evolution of plant traits. The authors report success in meeting learning objectives across student age-groups with this game. It is a step in the right direction, feels Navendu Page – a faculty member at the Wildlife Institute of India, Dehradun who studies plant diversity. “Even books for young children are about animals and don’t really cover plants,” he says. “The most useful aspect of this game is that it introduces students to concepts in evolution which can be quite difficult to understand” he adds. How do plants decide whether to fight or to grow?